Home Our Garage Door Services Garage Door Maintenance Has Your Garage Door Become A Hazard? Does your garage door creak, groan and rattle its way along as it moves? Do you tell yourself that it’s okay, that as long as it keeps working, there’s no need to worry just yet? Well, you’re not alone; many homeowners are happy to put off repairing their garage door until it actually breaks down. 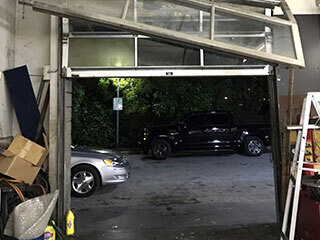 This is dangerous, though, and it puts anyone who uses your garage at risk - you never know when the door might actually fail and cause an accident. Here are some of the common danger signs you should watch out for. What Makes A Door Dangerous? Before we get started, here's a quick word about why it’s so important to look after your door. A typical single-span door is about 9ft wide, making it the largest moving part of your entire house. It can weigh more than 150lb – basically, anything of its size and weight suspended overhead should be treated with respect. You need to make sure it’s kept in good working order so that nothing catches you off guard. When accidents happen all of a sudden, this can be very dangerous. The first and most common danger zone is likely to be the springs. Many older garage door systems have never had their springs replaced, or even rebalanced, and this can lead to severe problems over the years. Bear in mind that a typical spring is only expected to last for around 7 years - how long have yours been in place? When these components start to wear, they're at risk of suddenly snapping with full force, causing potential injury and damage. If this happens while your door is moving, it may well come crashing down. All the parts of your door system need to move easily. If they don’t, the additional friction can cause a lot of wear and tear, pulling parts out of alignment and gradually causing the door to become unstable. Corrosion can also build up in areas that aren’t thoroughly greased, so be sure to apply a little lubrication at regular intervals. Many door parts can work themselves loose over time; pay special attention to the hinges and tracks, since these are often the root cause of a noisy door. It’s worth inspecting the rest of the system, too, to ensure all the connections are secure. Your door is equipped with several safety systems. It’s really important to make sure these are all functioning correctly, so take the time to check the auto-reverse and safety sensors. Use a block of wood to do this - never put any part of your body in the door’s path. Simply place it in the door's path and prompt your door to close – if it fails to reverse automatically, this is a sign that something in the safety component network isn't working as it should.